The Security Technical Implementation Guide (or STIG) documents describe cybersecurity requirements for a wide range of computer operating systems, routers, and other computing systems. They are written by DISA, the Defense Information System Agency, part of the U.S. Department of Defense. STIG details are based on concepts in NIST Special Publication 800-53, which specifies security controls for all U.S. federal information systems other than national security systems. The STIGs are far specific than "how to secure a server" or even "how to secure a Linux server". Specific STIGs exist for various Linux distribution and version combinations. For example, Red Hat Enterprise Linux (RHEL) 6 and RHEL 7, and Oracle Linux 5 and Oracle Linux 6. Other UNIX-family and Microsoft Windows operating systems are addressed in version-specific documents. There are STIGs for network equipment including A10 Application Delivery Controllers, Cisco IOS, various F5 BIG-IP devices, various Juniper devices, Palo Alto Networks devices, and others. STIGs also exist for individual software products, such as the Google Chrome browser, the Apache web server (with specific STIGs for both UNIX-family and Windows versions), the BIND DNS server, Microsoft Office, various VMware products, and others. There is even a STIG for keyboard-video-mouse switches! DOD used to provide the "Gold Disks" with testing scripts. Now a number of contractors are paid to create and maintain scanning software. These products do vulnerability scanning as well as test compliance to the Federal Desktop Core Configuration (or FDCC) and to the STIGs. I have a list of these products on another page. 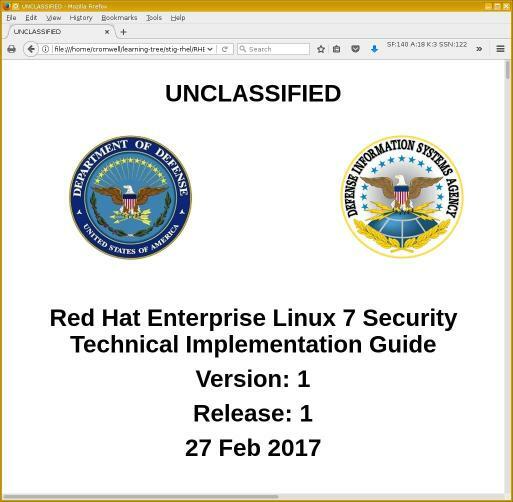 The following is my personal and entirely non-authoritative take on the RHEL 6 and RHEL 7 manual STIG documents. This comes from a project for a client. A major defense contractor had done poorly on a recent audit. A follow-up audit was approaching in a few months, and they were trying to figure out how to get their internal people up to speed. You can download a manual STIG document from the DISA site. It comes as a zip file with some meta-level "how to use this" PDF files, and a subdirectory with the document itself. Read the XML file with a browser. The *.xml file is the document, while *.xsl is a style sheet. There will also be a JPEG banner as seen here. I found that Firefox handles the document well, while Chrome may not. It starts with a large "UNCLASSIFIED" banner. You are left wondering whether the real STIG might contain something more or different. I don't think so, but there's no way of telling. A STIG contains a series of rules. Each rule involves a very specific test. Password maintenance leads to a large number of rules. One for length, four rules for each of the character classes that a password must contain, and rules for password change scheduling. A rule's title usually serves as a one-sentence summary. That is followed by a discussion which may or may not expand significantly on the importance of the rule or details of what it involves. The "Check Content" section tells how to test for compliance. Most of them direct you to run a command and see if certain output does or does not occur. A relatively small number tell you to inspect some configuration file, looking for specific content. Ensure it has its own partition or logical volume at installation time, or migrate it using LVM. Rule Title: The file permissions, ownership, and group membership of system files and commands must match the vendor values. Vulnerability Discussion: Discretionary access control is weakened if a user or group has access permissions to system files and directories greater than the default. Verify the file permissions, ownership, and group membership of system files and commands match the vendor values. If there is any output from the command indicating that the ownership or group of a system file or command, or a system file, has permissions less restrictive than the default, this is a finding. $ mount | grep "on /tmp"
Proportional fonts can leave you wondering about the white space within strings. This becomes more dangerous when you are told to run a command and verify that some output does not appear. Is your system OK, or did that output not appear because you didn't do the appropriate test? Notice in the above example rule that the first two commands have a space between the prompt character "#" and the command, while the second two do not. That does not give me confidence that the rest of the line is carefully formatted! For the most part, you can simply copy and paste the command text into a command-line environment. The prompt character, "$" versus "#", should indicate whether you need root privileges. However, a few rules indicate running a command as an unprivileged user when that won't work. This is where the problems begin. DISA now enforces the Risk Management Framework. Any talk about RMF usually focuses on strict separation of duties. You cannot simply rely on a system administrator's statement that their server is secure because they say it is. RMF requires that one person builds and maintains the server, and then a different person tests it for compliance. As is often the case, this is a great idea in theory, but practical situations quickly become, well, impractical. The reality is that because Auditors are not allowed to touch anything that they audit, they frequently to not understand what they are looking at. Very few are knowledgeable system administrators who moved into auditing. Most of them have little to no background in the systems they are supposed to audit. This was the point of my project. What does an auditor need to know in order to understand enough of what they're seeing to make reasonable decisions about compliance, and to direct system administrators to make all needed changes? And, of course, what is the bare minimum with which they can just barely scrape by, in order to minimize the training time and cost? What's In The Linux STIG? Enforce ownership and access to grub.conf, require a password to modify booting, and ensure that SELinux is enabled and enforcing a targeted policy. SELinux is required for the audit daemon to work. Partition the file systems, mount cautiously, make backups, and encrypt if needed. Install RPM PGP keys and set up a repository, install certain packages (including some McAfee software) and don't install certain others, and verify integrity of all package content and metadata. Restrict booting to single-user mode, start certain services and don't start certain others, schedule AIDE checks via cron, configure running services carefully, disable core dumps, and forward root's mail. Prohibit direct root login, lock system accounts other than root, enforce several password maintenance details, cautiously configure SSH, enable screen locking, configure user shell defaults, and display warning banners. Disable forbidden kernel modules (Bluetooth, USB storage) in /etc/modprobe.conf, and tune the kernel IP stack with sysctl. Configure Rsyslog and the audit daemon, and protect and rotate log files. But What Does An Auditor Really Need To Know? An auditor must be able to find their way around the file system, starting with the distinction between files and directories (and, eventually, symbolic links). This must include the concept of a file system tree structure. With the first set of commands they need to learn the basics of a command-line interface: the command itself as the first token, then options and parameters (and the distinction between those). They also must distinguish between good command output and error messages. That will only come with the familiarity that comes from time at the keyboard. Any plan to rapidly show people a few user commands, then look at a few system administration commands and configuration files, and then consider them to be useful Linux security auditors within a few days is absurd. Permissions, including how write permission on directories means you can remove and replace files. They will also need to understand SETUID, SETGID, and the Sticky bit for /tmp. With the above background, including plenty of time on the keyboard to become familiar with the environment, they would have a beginner-level ability as a user. All of these following in addition to the above user fundamentals. To perform and understand the STIG tests, they must understand what the following commands do. They must also have at least an idea of the purpose of the referenced file and their contents. A few of the fixes can be done with the following commands and changes to the referenced configuration files, but far more background is needed to safely carry out most of the needed changes. Here are the rule IDs as I assigned them for the RHEL 6 STIG. These are just the core numeric component of the rule ID. For example, "50482" for the rule named "SV-50482r2_rule".